The Photo of the Month reminds us that the best camera is the one in you have with you. 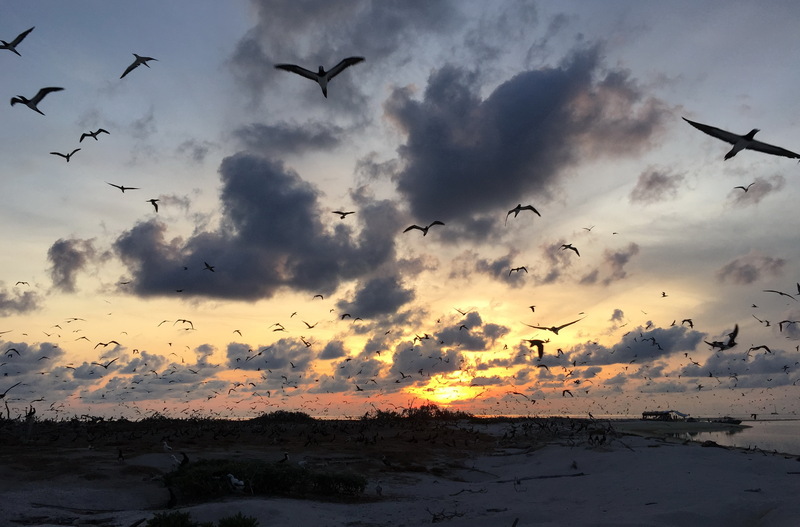 Christian Perez used an iPhone to perfectly capture the thrill and wonder of the early morning bird count at Bird Islet in Tubbataha. This was the magnificent sunrise on a magical island called Bird Islet on 10 May this year. As the sun rises, thousand of seabirds who make the islet their home fly off to start their day: Brown and Red-footed Boobies, Black and Brown Noddies, and Great Crested and Sooty Terns. The structure on the right side in the distance was our campsite. The Tubbataha Reef Natural Park consists of two large atolls in the Sulu Sea, popular with divers, and two islets on the north and south ends of the atolls: Bird Islet and South Islet. The islets serve as breeding and roosting ground for thousand of sea birds. The Park is managed by the Tubbataha Management Office (TMO) based in Puerto Princesa, and watched permanently by a group of resident rangers. This year I was fortunate to have been part of the team performing the Tubbataha seabird census organized by the TMO. Only once a year a team consisting of TMO staff, Tubbataha rangers, consultants, and volunteers is allowed to land on the two Tubbataha islets to count the birds. We spent 3 days on Bird Islet. This picture was simply taken with my iPhone 6 (with no post-processing) as Arne and I went to the other end of the islet to count the Brown Boobies that roost on a flat area called the “plaza”. The birds fly off at the slightest disturbance, so it was important to count them at first light before they fly. I estimated about 1000 Brown Booby on the ground that morning, many sitting on their eggs. The count result has not yet been published but the total number of birds on Bird Islet was perhaps around 25,000 based on my own estimate.